Are you ready for it? The one reason you should be involved with Compassion International starting today? It’s an easy answer to the question, but I know more questions are brewing in the back of your mind right now. Foremost of those is: What does holistic child development mean? It’s another answer, although a bit more involved. To summarize the idea into one word: Investment. It means that when you choose to involve your life with the life (or lives) of a child (or children), your money isn’t thrown at the problem. It means this isn’t a one size fits all approach. It means that Compassion gets involved in the community. It means that they get to know each child and their unique needs. It also means that you, as the child’s sponsor, get to know that child and watch them grow up and overcome poverty. Compassion partners with local churches – they get the local community involved with each child’s development. And, because of this, they also meet the needs of the community as a whole. Does it work? Does this investment, Compassion’s and Your, work to release children from poverty? Empirical, independent studies say: Yes, yes it does. Now, another question might have surfaced in your mind: Why should I get involved? It sounds like a lot of other people are already helping. The simple answer? The more hands involved, the more children that are freed from poverty. You’ve probably heard the old parable about the little girl and the starfish. She walks along the beach with her grandpa and see hundreds, thousands of starfish washed up on shore – near death because they’re baking in the sun. She begins picking them up, one by one, and tossing them back into the sea. The grandpa tells her that it’s impossible for her to save them all, what difference does it make? She simply tells him, as she tosses one into the sea, that it made all the difference to that one. Now, what if her grandpa started helping? And someone passing by started helping. And more and more and more. You can make all the difference for one child today. Just click on the picture below. 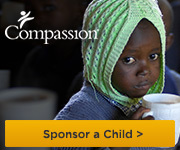 That will take you to Compassion’s site where you can choose a child to sponsor. I still don’t like the sponsor word – you’re committing to them. You’re investing in them. Go ahead – click the picture. I made it easy and have it on my sidebar, too. Make that difference today. There’s no better day than today to make a difference in someone’s life. What do you think? How will you make a difference today?